Dubai - Architects are agreed on one thing: An iconic building is often the result of just a few, genial strokes of the pen. The stylised form of the Eiffel Tower was dashed off in this way, along with the spectacular Burj Al Arab hotel which dominates the Dubai skyline. Both buildings made headlines, each in its own era, and in December the Burj Al Arab celebrates its first ten years. The structure, which resembles a giant billowing sail, has become one of the most notable landmarks in the Gulf emirate. It is one of the most luxurious and most expensive hotels in the world but much more besides. The hitherto unknown level of opulence catapulted the building into the limelight a decade ago, turning what used to be an Arab backwater into a meeting point for the rich and famous. "There is a myth surrounding this hotel. We never claimed to be a seven-star establishment but we have acquired that reputation," said Heinrich Morio, general manager of the Burj Al Arab. Perhaps the considerable reputation of the hotel arises from 202 lavishly-appointed duplex suites or the seemingly endless 22-carat gold-plated surfaces. Adding to the upmarket impression is an unusually large staff of 1,500, whose job it is to pamper the guests. This amounts to seven employees per visitor. The prices are definitely sky high - they start at around 2,800 dollars a night. Such features made the hotel unique when it first opened. "We cater for the world's most discerning guests and the level of expectation is extremely high," said Morio who hails from Germany. 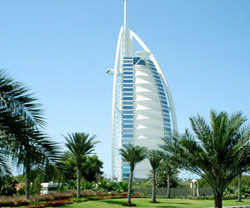 Despite the global economic downturn, the Burj al Arab has not lowered its prices and is well-booked, he added. Gaining access to this noble house of Arabian hospitality on Jumeirah Beach Road is not as straightforward as it looks and a guarded causeway prevents tourists from simply strolling through the entrance. Those without a reservation in one of the restaurants or a booked room for the night are left to gaze at the 321-metre-tall space-age structure from the outside. For illustrious guests a fleet of ten chauffeur-driven Rolls-Royce limousines is available to transport them from the city's airport. Before that could happen the emirate had to make a name for itself worldwide. The Burj Al Arab placed a key part in that strategy. "The owners wanted to create the most handsome, luxurious and splendid hotel the world has ever seen," said the manager. A brief on this scale made it easier for the architects and designers to create features shared with only a handful of hotels in the world. One example is the pets department where British-born Warren R Baverstock looks after the hotel's numerous aquariums. "I came to Dubai ten years ago and as I lay on the beach and gazed at the hotel I was simply thrilled," he recalled. Back then he quickly made up his mind to trade northern Europe for the heat of the desert. Dubai's signature building no longer stands alone and in December of this year it is set to be dwarfed by the new Burj Dubai, the projected world's tallest structure with more than 160 floors. The new hotel has been the subject of much speculation regarding its precise height - the official word is that is stands at over 800 metres - along with the exact opening date and the scale of planned public celebrations to mark its inception. The investment costs are no secret and it is well known in Dubai that this latest superlative structure cost around a billion dollars to erect.